Superhero-themed films are dominating the summer box office. Is it just about the bottom line or our national longing for genuine heroism? 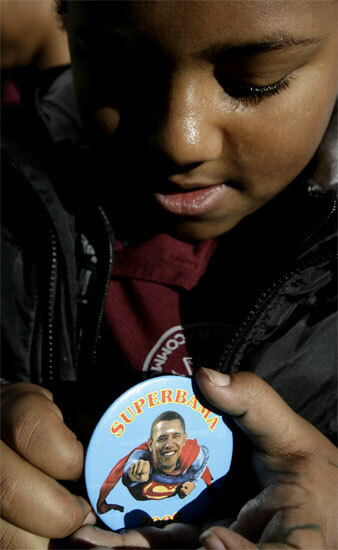 Christian Spiegel, 12, pins on a button while waiting in line for an Obama event in Jersey City, NJ. It’s only mid-July and summer’s superheroes have already lifted box office grosses to record heights. In May there was Iron Man, a morally indefensible but undeniably entertaining vehicle that made an unlikely action star out of Robert Downey Jr. Then there was the return of Indiana Jones, who may as well be classified as a superhero, since he manages to appear impervious to pain at the tender age of 65. Then came The Incredible Hulk, Hancock and Hellboy II. This past weekend the highly anticipated and truly superb Batman sequel, The Dark Knight, hit theaters, and it managed to score the biggest three-day opening gross in box office history. Sure, this genre has been popular for some time–Christopher Reeve’s pitch-perfect Superman set the template thirty years ago. But it’s fair to say that comic book-inspired films have never been so dominant. What does this mean and why is it happening now? The easy explanation, not altogether incorrect, is that at a time when A-list stars are both in short supply and incapable of guaranteeing that a film will be a hit, a comic-book franchise delivers a sure-fire fan base ready to shell out ten bucks or more, whatever the quality of the film. But audience research has shown that these films tend to have a broader appeal. Regardless of age, race or gender, Americans devour superhero films, and it would be a massive oversight to trivialize or overlook the sociopolitical ramifications of this phenomenon in our highly politicized age. Hollywood effectively turned into a superhero movie-making assembly line in 2002, when Spider-Man swooped in to ostensibly cure America’s case of the 9/11 blues. As played by the lovable, all-American Tobey Maguire, Spider-Man was the perfect antidote to those bleak days. The film was a huge success, and in addition to its two sequels in the six years since, more than ten superhero movies have individually grossed over $100 million dollars domestically. Only about half of these films received even a hint of critical praise, few had bankable stars and only a couple featured instantly recognizable characters. One could argue that their success was more about expectations and wish-fulfillment than anything else. Superheroes can be symbols of our greatest hopes, but they also appeal to our more pragmatic desire to get results. Superhero films are not unlike romantic comedies, in that their endings are pretty much inevitable. No matter how flawed the hero or how formidable the foe, the audience knows the hero will triumph at the end, usually in an explosively entertaining fashion. There’s something gratifying about that. We like to see one incredible figure rise above the odds to do what’s right, to bring a crisis to an end. In our real lives–especially during the past eight years–we’ve seen so few true heroes emerge from within the ranks of our nation’s leadership. So few have bucked trends or questioned authority from a position of power. The President’s cabinet and, sadly, the Democratic-controlled Congress (whose approval rating is at an all-time low) is so full of corrupt men and women that a consistently conservative Republican Senator like Chuck Hagel is deemed a maverick simply because he disagrees publicly with the President on Iraq. Filmgoers this summer know who the real “mavericks” are: Iron Man and Hancock, two boozing, belligerent and obnoxious characters who are also no-nonsense good guys who get the job done. They provide an endearing counterpoint to the enduring incompetence that has come to personify the Bush White House. At the end of the day we don’t care if our heroes win ugly–we just want them to win and do the right thing. Even Batman, the most infamously surly and disturbed of heroes–is ultimately noble. In a telling scene during The Dark Knight, the Joker taunts Batman by saying, “You’re so incorruptible, aren’t you! ?” He is, and that’s precisely why audiences continue to show up in droves to cheer for him after five previous films and several series reboots. Furthermore, despite the fact that it is an enormous blockbuster extravaganza, The Dark Knight manages to handle grown-up subjects such as domestic surveillance with more frankness and honesty than our own real-life representatives. This is either incredibly heartening or disheartening, depending on your point of view. More than any other politician in recent memory, Barack Obama has tapped into our national preoccupation with hero worship. In some ways, he has many of the characteristics of the traditional superhero. He has a complex, fantastic back story, dashing good looks and he carries himself with just the right balance of self-confidence and humility. Of course, this is real life, and that’s when the negative aspects of a superhero’s mystique manifest themselves. Many of Obama’s supporters heap almost superhuman hopes upon him. They want to believe he has the power to wipe away the stains of eight years of Bush, bring back our civil liberties and–who knows–maybe even stop global warming, all while riding on a unicorn. OK, well maybe they don’t go that far–but they can be accused of being almost childishly optimistic. On a certain level, who can blame them? The success of these movies just shows how hungry we are for a genuine hero–someone about whom we can feel unabashedly good. But as the Batman films routinely reveal, there is a dark side to our superheroes, especially our contemporary ones. Christopher Reeve’s Superman wouldn’t stand a chance in today’s über-cynical environment. Whether it be by his FISA flip-flop, his oddly genial appearance on Fox News or his vagueness about residual forces in Iraq, Obama has proved himself to be very mortal and less than heroic on numerous occasions. For those voters who see him as the superhero who will quickly deliver America from its eight-year-long nightmare, there will inevitably be a letdown if he wins office. This country appears to be looking for a super-heroic moment, and we may not get it anytime soon. But we won’t stop looking for it–in the movie theater or in real life.